Ant sting allergy is relatively common within south-eastern Australia and is predominantly due to Myrmecia pilosula (Jack Jumper Ant, JJA). 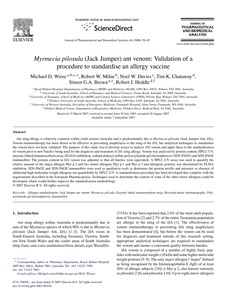 Venom immunotherapy has been shown to be effective in preventing anaphylaxis to the sting of the JJA, but analytical techniques to standardise the venom have not been validated. The purpose of this study was to develop assays to analyse JJA venom and apply these to the standardisation of venom prior to new batches being used for the diagnosis and treatment of JJA sting allergy. Venom was analysed by protein content, HPLC-UV, enzyme-linked immunosorbent assay (ELISA) inhibition, sodium dodecyl sulfate polyacrylamide gel electrophoresis (SDS-PAGE) and SDS-PAGE immunoblot. The protein content in JJA venom was adjusted so that all batches were equivalent. A HPLC-UV assay was used to quantify the relative amount of the major allergen Myr p 2 and two minor allergens Myr p 1 and Myr p 3 and allergenic potency was determined by ELISA inhibition. SDS-PAGE and SDS-PAGE immunoblot were used as qualitative tools to determine the protein profile and presence or absence of additional high molecular weight allergens not quantifiable by HPLC-UV. A standardisation procedure has been developed that complies with the requirements described in the European Pharmacopoeia. Techniques used to determine the content of some of the other minor allergens could be developed, which would further improve the standardisation methodology.